Holly Willoughby, one of TV’s most famous faces! The smiley face of ITV show, This Morning! Holly Willoughby is definitely Queen of style! Every morning she brings out another gorgeous outfit! 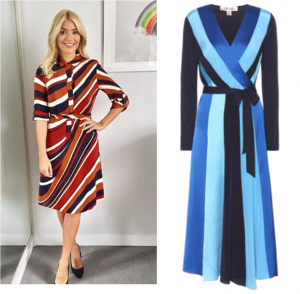 This blog will feature some of our favourite looks from Holly Willoughby’s wardrobe and our choice for similar dresses to hire! Hire a Alice + Olivia dress printed dress and look amazing with the bold abstract flowers and ladylike silhouette. This Alice and Olivia Dress is perfect for any event you may have coming up! We love it for the races, paired with a pair of wedges and a fabulous hat! Hire a dress and get Holly’s look! Renowned for her wrap dresses, Diane Von Furstenberg offers an update to the classic with the Penelope dress. Crafted from silk, the dress displays stripes of different texture and colour for a flattering, silhouette-elongating effect. Be inspired by Holly’s stripes and hire a dress from us! This Sequin dress from NLY. Has a rounded neckline and is open in the back with fastening at the back of the neck. It is a tight fit and very sparkly. Go all out in a sequin mini dress and hire a dress from us! This dress by Roland Mouret shows fantastic tailoring – coloured bright green with black sleeves, this V-neck silhouette is made even more sultry with a gold-tone zip that runs all the way down the back. The perfect all round dress! Posted January 17th, 2018 in GMD Daily, Uncategorized. Tagged: Alice and Olivia, alice and olivia dress, American fashion, as seen on celbs, as seen on celebrities, black celeb dresses, Brits celebrity dresses, celeb boutique, celeb dress, celeb dress hire, celeb dresses, celeb dressescocktail dresses cocktail+dresses cocktail dress, Celebrities in Girl Meets Dress, Celebrity, Diane Von Furstenberg, Diane Von Furstenberg dress, Diane Von Furstenberg dresses, dress, Dress Hire, dress hire leeds, dress hire london, dress hire manchester, hire alice and olivia dress, Hire Diane Von Furstenberg dresses, hire nly, Hire Roland Mouret, Hire Roland Mouret dress, hire Roland Mouret dresses, NLY, nly dress, prom dress hire london, prom dress hire uk, rent alice and olivia dress, rent DIANE VON FURSTENBERG, Rent Diane Von Furstenberg dresses, rent nly dress, Rent Roland Mouret dresses, Rent Roland Mouret gowns.